The Arts Fund is excited to announce the opening of Eyes of Another, curated by Rosemarie Gebhart and Marcello Ricci. A reception will be held at The Arts Fund Gallery on Friday, November 10th from 5-8 pm during the Funk Zone Art Walk. The exhibition will feature work by Pamela Benham, Lety Garcia, Diane Giles, Holli Harmon, Ruth Ellen Hoag, Cynthia Martin, and Maria Miller. discoveries and new meaning to their work. 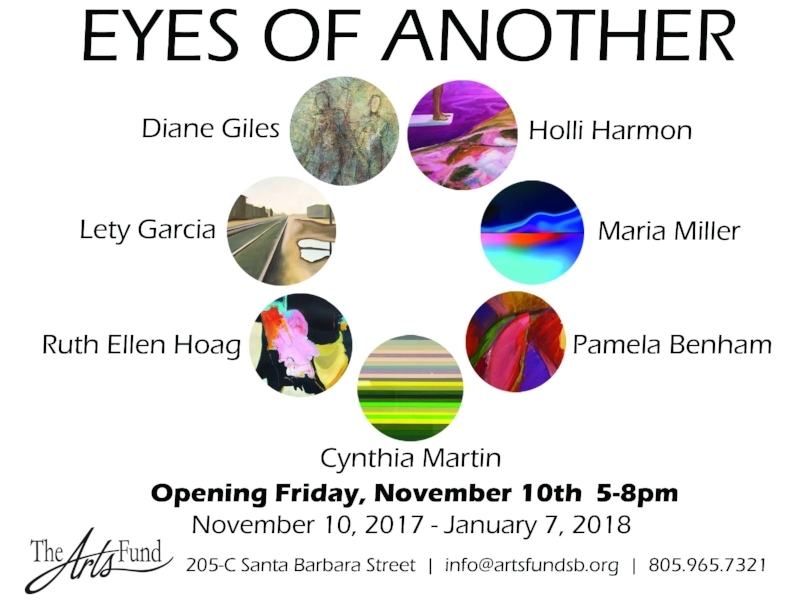 The artists in this show reinterpret the Santa Barbara scene by allowing us to see with New Eyes, that which we have seen a hundred times, but maybe have walked on by. Their creativity, by using a variety of techniques, allows us to visualize and appreciate an urban scene fast disappearing, a landscape eroding before our very eyes brought by environmental changes, changes within our own interior worlds captured by an abstraction of senses. Did these artists’ answer the question art is not what you see, but did we make you it see through our eyes?